Fate was cruel, and all were scared. To raise a roof for the common good. And marriages were often cheered. Their vision clear would not be spoiled. We pray for them and you as well. 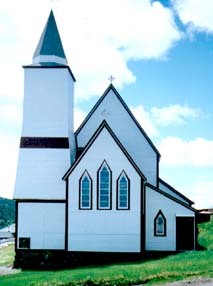 The church they built in old King's Cove. Page contributed by: William Warren with permission from the Author "Roger K. Brown"